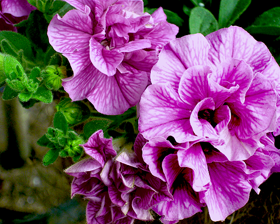 Here is the ultimate colour selection in fully double Petunias. Large fully double 7cm blooms of lilac pink with purple veins, flowering earlier than many other varieties. Extremely uniform, eye-dazzlingly colourful in beds, borders or containers. Flowers June-October. Height 25-40cm.